Back in December, Saitek opened the hanger doors to one of the most ambitious FSX modding projects ever witnessed. 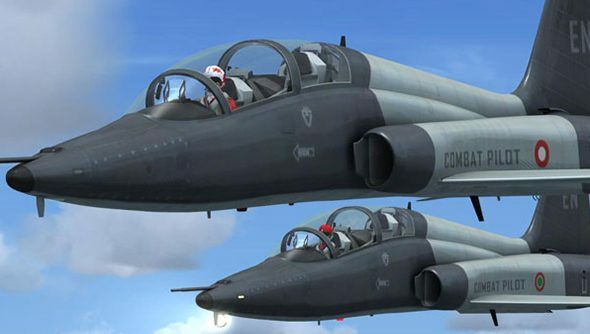 Combat Pilot took the erstwhile FSX engine and completely remade it into a fully working military aviation suite in which for a regular subscription players could go through a series of evaluations and training flights, qualify to become air-to-air or air-to-ground specialists, enlist in a squadron of other like-minded pilots and – here’s the kicker – actually fly combat missions with and against each other. With actual working guns and that. 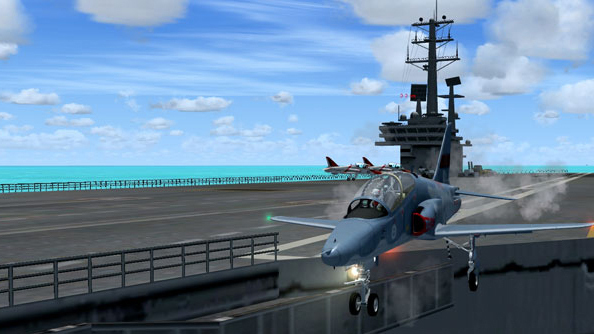 Players have flocked to Saitek’s experiment since it launched, filling the skies with the kind of aerial action that FSX’s pilots had only previously been able to experience within their own imaginations, however realistic the cockpit switches of their simulated fighter aircraft had been. One of the few things holding many back though has been the regular fees required. To that end, Saitek has recently opened up its version of a try-before-you-buy system, the Combat Pilot Flight Screening Program, giving players the chance to try out the various training scenarios ahead of jumping into the full game. We caught up David Kinney, Vice President of Thunderhawk Studios, the development team behind Combat Pilot to talk about how the game got started and how it’s fared since launch. PCGN: What was the kernel of inspiration behind Combat Pilot? Kinney: As a United States Marine Corps Officer, and later while working as an engineer on both the B-2 & F-22 avionic and simulation development programs, I became obsessed with building a flight simulation experience that would allow everyone to fly military aircraft in an integrated environment. This led me to build several Flight Simulation centres, the first of which was Fightertown, and several flight simulation games including Saber Ace and Luftwaffe Commander. But really I always wanted to bring the world together and start a community of military aviation enthusiasts. PCGN: Why Flight Sim over an engine such as IL-2, for instance, that already supported combat dynamics? Kinney: I wanted Combat Pilot to be first and foremost a ‘flight simulation’ – not so complicated as to require hours or weeks of study, but enough to get a real feel for the thrill and the dynamics of flight. With all of its drawbacks, FSX is still a beautiful platform and a very good engine. Try building one to emulate its capabilities – the investment would be enormous and not justifiable in today’s market. On the other hand, I didn’t want to take a combat sim and try to bring it up to the standard I sought, including elements such as a worldwide database, accurate ‘time of day’ and weather effects, beautifully-rendered scenery and aircraft, and a well-established third party development community. PCGN: How did it feel the day you pushed the ‘on’ switch and opened the doors officially to players around the world? Kinney: I worked on the design of Combat Pilot for almost four years and it took almost two years just to get the first Flight Training Operations out. It was a rewarding time, but there was a real sense of work to be done. Unlike other games I’ve worked on, Combat Pilot is an evolving program; a program at its infancy. We have so much more that we get to do – Combat Training Operations (just out) and Sudden Storm, or war in the desert. We want to add Multi-engine cargo aircraft, helicopters and bombers, as well as patrol boats and SAM sites. Again, why FSX? Growth! World-wide growth. PCGN: Nearly a month on now and how has reception been? Kinney: Current Combat Pilot members really seem to like the simulation, although I think they are really looking forward to combat. Combat Pilot was designed to be a multiplayer game – I won’t be happy until we’ve reach a very large community of engaged pilots. PCGN: Where does CP go from here? Kinney: By the end of April, Combat Pilot will have over 30 aircraft flying in the colours of 27 countries. Refuelling, carrier ops, air-to-air and air-to-ground combat, recon flights, re-supply – all of this on a global scale. In short the best flight simulation product ever offered. Have a look for yourself over at combatpilotseries.com where you can try out the free flight screening program and if you like what you see, sign up for the monthly subscription and join one of the 76 currently active squadrons flying ops around the world.